There is one thing we all want for our children. . . opportunity! For young children and teenagers, opportunity often comes through school and, if you are lucky, great teachers. Next Generation: Cord Blood would like to applaud Barbara Torrey and Katy Gazda. This dynamic duo teaches at Red Mountain High School in Mesa, Arizona. Take our word for it. . . these folks are passionate about science and teaching! Everyday these Torrey and Gazda work hard to help students understand the important of science in our lives. They make science fun and real!! They know that students will only learn and truly appreciate what they are learning when they see the need for this information in their own lives. This is why they have been so proud to bring NEXT GENERATION: Cord Blood to their school. Torrey and Gazda recognize how relevant the topic of cord blood is to their students. Regardless of whether or not they are hoping to pursue a STEM career, the use of cord blood and related cellular therapies are here to stay. We need to understand it. We need to know how we can take advantage of new treatments for our families and ourselves. 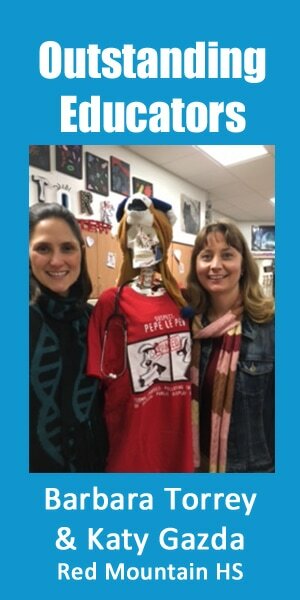 Inevitably, our children, Ms. Torrey's and Ms. Gazda's students, will benefit the most from this evolution in medicine. They are the NEXT GENERATION and they deserve to know. ​Thank you both for making sure that your students learn about the latest in cellular therapies and non-controversial stem cells. Thank you for making Next Generation: Cord Blood part of your curriculum!